Living in a small apartment that is currently surrounded by snow, it should come as no surprise that I don’t get a lot of opportunity for gardening. Lucky for me, I have an iPhone, so even when I can’t commune with nature, nature can come commune with me. The free Flower Garden app may not have quite the same earthy flair as a real garden, but at least you don’t have to deal with bugs or dirt under your nails. In many ways, Flower Garden feels a lot like playing Farm Story, We Rule, or any other social game that has you obsessively checking your stuff throughout the day, but in a much gentler and calmer manner, and random Facebook friends are more likely to appreciate getting a pretty bouquet of digital flowers instead of ingredients for a game they don’t play. Instead of crops, sheep, or zombies, you’re just tending to flowers in pots. You start with a handful of pots and must grow your plants from seeds. Flowers can grow in a matter of minutes, hours, or even days, depending on the type. Tending to newly planted seedlings mainly consists of keeping them properly watered; not too much or too little water or else the plant will wither or wilt, and you have to check up on them regularly, just like a real plant. Each seed packet will yield a different number of blossoms each time, and in random configurations, so it does feel a bit like you’re tending to a new plant every time. When the flowers have bloomed, you can cut the blossoms and add them to a digital bouquet, which you can send to friends either through Facebook or via email with a nice note. There aren’t a whole lot of basic seeds to grow initially, but you unlock more as you plant new flowers or by sending bouquets to friends. 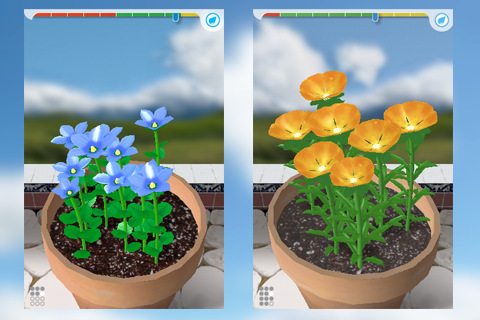 You can also make in-game purchases of new seed types, more garden space, or packs of special fertilizer that let you grow flowers faster, so parents should keep an eye on kids when playing with this app. The app was made free for a limited time for Valentine’s Day, so jump on this one if you’re interested. It’s essentially a kinder, sweeter, more mom-friendly version of the near limitless freemium games out there, and while it’s easy to play with and somewhat relaxing, it doesn’t offer anything particularly amazing. The graphics, while pretty and pleasant, are nothing to write home about. Overall, it’s not a mind-blowing app, but there’s a fair amount of gentle satisfaction to be had from tending your digital garden. Also, the bouquets, because of their interactive and customizable nature, become a cheap and simple way to brighten someone’s day. 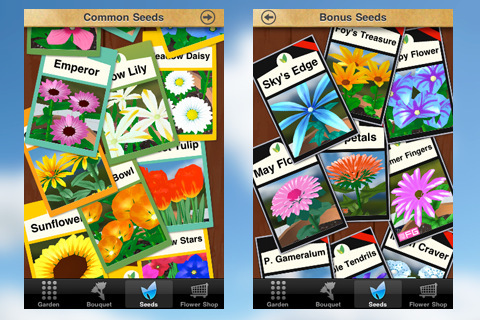 AppSafari review of Flower Garden – Grow Flowers and Send Bouquets was written by Tracy Yonemoto on March 11th, 2011 and categorized under App Store, Free, Games, iPad apps, Mini Games, Universal. Page viewed 7475 times, 1 so far today. Need help on using these apps? Please read the Help Page.